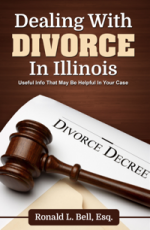 If you and your spouse are divorcing and you are the spouse who either brings in all or most of the income, you may be dreading the fact that you may have to pay Illinois spousal support (alimony) to you ex for years to come. When determining if and how much alimony will be awarded, a court will look at factors such as how long you’ve been married, the income of both parties, your and your spouse’s earning capacity, the standard of living enjoyed during the marriage, age and health issues, and also each party’s needs. A court looks at many factors when deciding whether spousal support will be awarded. So, if for example, you have been married 20 plus years and your spouse gave up his or her career to stay home with the children while you pursued a successful career, there may very well be a finding for alimony barring any circumstances that prevent you from continuing in your employment such as health or age. Is there any way around paying spousal maintenance in Illinois? There is no guarantee that you will not have to pay Illinois spousal maintenance, however there are steps you can take during the settlement process that may help you avoid the payment of spousal support if you are willing to negotiate. One way many spouses avoid paying monthly spousal support is to give your spouse something else when dividing marital assets such as the family home or a pension in exchange. Although you are giving up something, you will not be on the hook for monthly maintenance payments. If spousal maintenance is ordered, then there is always the possibility that you can have it modified or terminated at a later date if your or your ex’s circumstances change. It may be that you are forced into retirement and you do not have the same financial resources or the ability to rebound. It could also be that your spouse has remarried and has the benefit of financial support from a new spouse. If there has been a significant change in circumstance since the divorce, it is worthwhile to discuss a modification to spousal maintenance with an experienced family law attorney. Of course, your best line of defense against having to pay spousal support is to secure a prenuptial agreement before you marry or a post-nuptial agreement during the marriage, the sooner the better. Entering into a formal agreement with your spouse that specifically rules out the payment of alimony in the event of a divorce is your best option overall. If you are considering divorce and would like more information regarding spousal maintenance payments or other issues such as parenting time and responsibility, or, if you are seeking a post-divorce modification for the same, contact the Libertyville Law Offices of Ronald L Bell & Associates PC for immediate assistance at 847-495-6000.